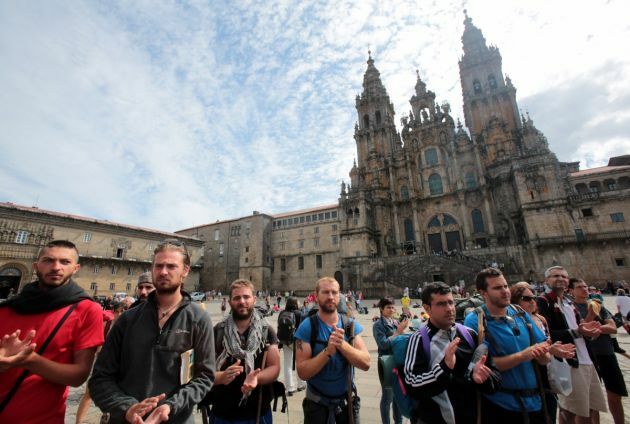 (Photo: REUTERS / Miguel Vidal)People applaud after observing a minute's silence for victims of a train crash, in front of a cathedral in Santiago de Compostela, north-western Spain, July 26, 2013. The driver of a Spanish train that derailed, killing at least 80 people, was under police guard in the hospital on Friday after the accident, which an official source said was caused by excessive speed. Pope Francis, world and European church leaders have expressed sorrow and offered prayers after a train crash in Spain on July 24 took the lives of 78 people. The head of the World Council of Churches at the same time called for European transport officials to take steps to prevent a similar disaster. Most of the victims were from Spain, along with some passengers from Algeria, the Dominican Republic, Mexico and the United States. The crash near the railway station near the shrine at Santiago de Compostela was Spain's worst rail disaster in nearly 70 years. The BBC reported Friday that more than 140 people were hurt as well as those killed in the passenger train derailment in north-western Spain on Wednesday. The train driver, Francisco José Garzón Amo, 52, was arrested Friday police in the Galicia region said on suspicion of reckless behaviour. Pope Francis sent a telegram on July 25 from Rio to Archbishop Julian Barrio of Santiago de Compostela saying he was praying for the victims. The general secretary of the World Council of Churches, Rev. Olav Fykse said Friday, "While praying and mourning in the aftermath of this catastrophe, we call upon all those responsible for the security of public transport in Europe and beyond to strengthen their efforts in order to avoid such disastrous events in the future. "God has given us the gift of life as a precious gift, and no resource should be considered too expensive in protecting and preserving it." The WCC leader said that on July 29, the weekly common prayer service at the Ecumenical Centre in Geneva will address the crash along with similar global disasters in recent weeks. The general secretary of the Geneva-based Conference of European Churches, Rev. Guy Liagre, shared his grief with the victims saying in a statement Thursday, "We ask God to give faith, strength and comfort to deal with such painful moments."